Many adolescents and adults are not up-to-date with CDC-recommended life-saving immunizations. Our pharmacists are professionally trained to administer the following adolescent and adult vaccines to help you and your loved ones stay healthy. About: Influenza (the flu) is a contagious respiratory illness caused by influenza viruses. It can cause mild to severe illness. Some people, such as older people, young children, and people with certain health conditions, are at high risk for serious flu complications. The best way to prevent the flu is by getting vaccinated each year. Our Comments: Corporate policy is 9 years or older. About: Shingles is a painful localized skin rash often with blisters that is caused by the varicella zoster virus (VZV), the same virus that causes chickenpox. Anyone who has had chickenpox can develop shingles because VZV remains in the nerve cells of the body after the chickenpox infection clears and VZV can reappear years later causing shingles. Shingles most commonly occurs in people 50 years old or older, people who have medical conditions that keep the immune system from working properly, or people who receive immunosuppressive drugs. 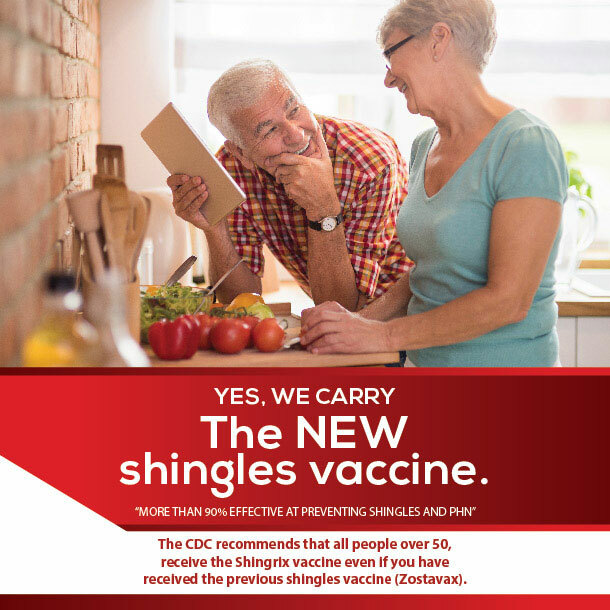 The only way to reduce the risk of developing shingles and the long-term pain that can follow shingles is to get vaccinated. Our Comments: ACIP = 60 and older. Many plans won't pay for under 60. About: Pneumococcal disease is an infection caused by a type of bacteria called Streptococcus pneumoniae (pneumococcus). There are different types of pneumococcal disease, such as pneumococcal pneumonia, bacteremia, meningitis, and otitis media. The pneumococcal vaccine is very good at preventing severe disease and other related issues. Target Group: 65 and older two doses; patients with underlying disease ages 19-64 (e.g.diabetes, asthma, chronic lung disease, smokers) OR immune suppressed. About: Tdap vaccine provides years for protection against tetanus, diphtheria and pertussis (whooping cough). Protection provided by the DTaP vaccine received in childhood wears off as kids get older, so preteens and teens need a booster shot known as Tdap. Getting this booster not only protects preteens and teens, but also the people around them—especially little babies and elders. Those 13-18 year olds who haven't gotten the Tdap shot yet should talk with their parents and their doctor about getting it now. Target Group: Infants and children between ages 2 mo and 6 yrs 5 doses; Adolescents one dose at age 11-12; Pregnant women preferably at 27-36 weeks gestation; and all other Adults every 10 years. Our Comments: Corporate policy is 9 years and older. About: Hepatitis B is a serious disease caused by a virus that attacks the liver. The virus, which is called hepatitis B virus (HBV), can cause lifelong infection, cirrhosis (scarring) of the liver, liver cancer, liver failure, and death. Transmission of the Hepatitis B virus results from exposure to infected blood or body fluids containing blood. The Hepatitis B vaccine is available for all age groups to prevent HBV infection. About: Meningitis is caused by organisms that are spread person to person by close contact. This disease can cause inflammation around the brain and spinal cord. The vaccine is recommended for college students living in dormitories, military recruits, international travelers and those with weakened immune systems. Meningococcal vaccines protect against most types of meningococcal disease, although they do not prevent all cases. There are two kinds of vaccines that protect against Neisseria meningitidis available in the United States: meningococcal polysaccharide vaccine (Menomune®), and meningococcal conjugate vaccine (Menactra® and Menveo®).